Customize this plush armchair with our wide range of options to build the style that best fits your decor. Hundreds of fabrics in a stunning range of colors and textures are available to upholster your signature chair, making this piece truly and distinctly yours. 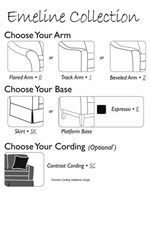 The Emeline Customizable Chair with Track Arms and Wood Legs by Best Home Furnishings at Best Home Furnishings in the St. Louis, Chesterfield, St. Charles, MO & Waterloo, Belleville, Edwardsville, IL area. Product availability may vary. Contact us for the most current availability on this product. The Emeline collection is a great option if you are looking for Traditional furniture in the St. Louis, Chesterfield, St. Charles, MO & Waterloo, Belleville, Edwardsville, IL area. Browse other items in the Emeline collection from Best Home Furnishings in the St. Louis, Chesterfield, St. Charles, MO & Waterloo, Belleville, Edwardsville, IL area.